Monday I planted six broccoli starts and three sunflowers I got from neighbors across the road. The broccoli is in the small garden dug last year, and the sunflowers are along the new garage wall. In the mid-week heat that peaked at 85 degrees the sunflowers grew an inch or two, but last night, anticipating frost, I covered them all with plastic. This morning’s thermometer is at 35, so no frost, but the next two nights are to be colder. All week the bright colors of spring have been melding into a summery green. Daffodils droop. Across the lush lawn dandelions frolic. Wild strawberries roam freely. One evening, about six or so, when the first storm of the week blew in with a smack of southern wind, the grass in the fields waved and flattened and fluttered. 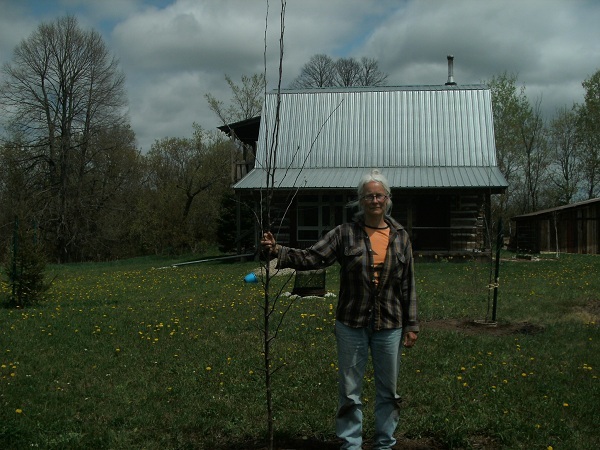 That was the day I planted apple trees, one Honeycrisp, about six or seven feet tall, and one Fireside, a bit taller. They are in front of the cabin where scrap wood piles used to be. The charred, ashy ground may or may not be good for apple trees, but it was certainly good for digging holes. Overall, it has been a week of small events. I saw my first porcupine and ate my first trout dinner from the river. Also, in a dream, I bought a dog at Walmart. A little brown and white dog, kind of like a chihuahua but not as fragile, not as tiny, not as shaky. This dog had substance. The cashier put him on a scale to scan him, but there was some difficulty, so another Walmart person came over to help. Meanwhile, I was talking to the dog, saying “What a good dog! You are such a good dog!” because the dog was just standing there on this steel platform looking at me over his shoulder, so patient, so good, and so completely unconcerned. He wore a heavy robe of quills over his body and on his paws big mitts of quills. On his tail, more quills. He kept moving slightly, but didn’t go anywhere, and once in a while he would stop to do the quill thing, opening them up, closing them down, like a slow tune on an accordion. Elliott had followed me, and when he came up behind I held him back. After a minute or two he turned and headed home. I stayed for a bit, to watch the porcupine. 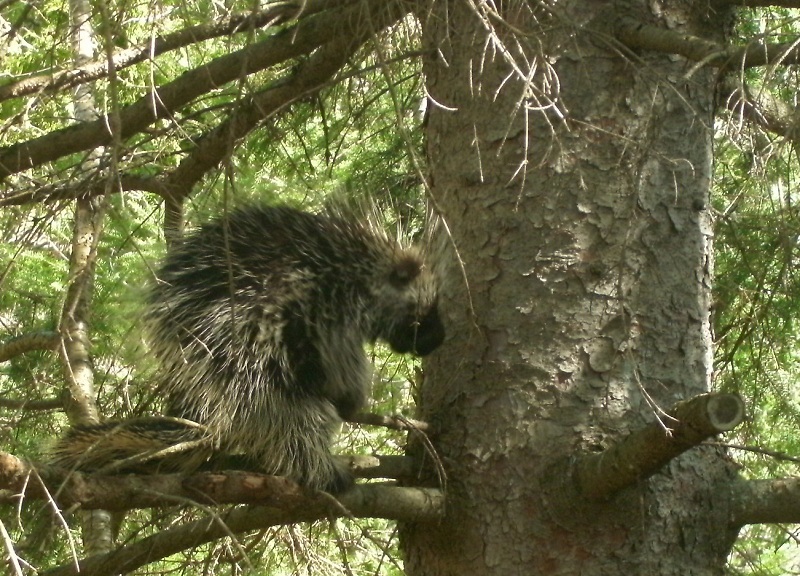 My first porcupine, a little bristly. Porkies do not shoot their quills; they don’t need to. The quills come out easily enough. Just touch one and you’re in trouble. Porcupine gives us the power to reflect aggression back to its source. 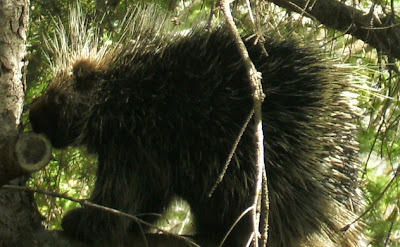 How hard an animal strikes a Porcupine is how deeply the quills will be embedded. But there are no quills on the porkie’s belly. A fisher (those weasels!) can sneak under porcupines, flip them over, and attack with great success. The message is this: Everyone is vulnerable in some way, so don’t let your ego make you feel invincible. Between porkie sightings I visited a friend who I don’t get to see much. He kind of reminds me of a porcupine, or maybe the porcupine kind of reminds me of him. A neighbor did the fishing, caught trout, dropped off a couple. I fried them up for dinner. I had been down at the river earlier that same day, saw a muskrat, got a mosquito bite. On my way back to the cabin a turtle crossed my trail. He (or she) was about the size of a salad plate, maybe six or eight inches across. 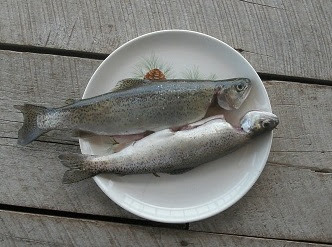 Two trout on a plate. So it’s been that kind of week. As I stood on the porch one night waiting to see if Elliott would come in, mist and fog rose and swirled through the darkening light and wound its way through rain-slicked trees. 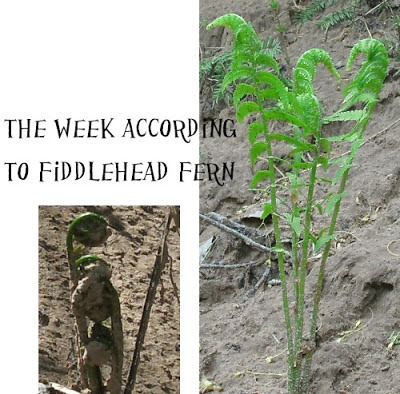 Frogs croaked and sang, insects whirred and buzzed, birds squawked and hummed. Every morning, the rich smell of spring has taken me back to every spring of my life, and one morning down at the river a sharp aroma of rain-washed cedar and spruce and woods simply hurled me back to the few childhood memories I have of being in the woods of Wisconsin. My parents were not campers, and they had no use for the woods except for the occasional walk through and for gatherings with friends. And the memories we share of those times are of the people and of the parties. But when alone, the memory I share with myself is of the rich smell of damp woods, unfurling.